Please use the form below to subscribe to our DEMOS Newsletter free of charge. Yes, I hereby consent to receive information and documents on current real estate projects, sales offers and events and to the sending of the DEMOS Newsletter by mail, telephone or e-mail in accordance with the contact information (mailing address, telephone number, email address) I have provided above. I acknowledge that I may revoke this consent at any time by contacting DEMOS by mail at Thalkirchner Str. 26, 80337 Munich, by telephone at +49 (89) 231 73 – 0 or by e-mail at info@demos.de. Revoking this consent will not incur any charges from DEMOS. 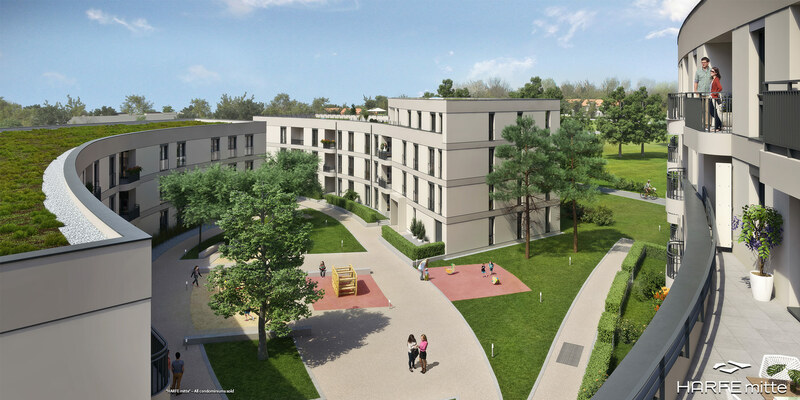 In its new-build project in Munich-Neuaubing, DEMOS created modern one- to four-room condominiums in the heart of the new Gleisharfe neighborhood. All "HARFE mitte" condominiums have now been sold. We would like to thank all buyers for their trust as well as everyone who helped turn this project into reality. The "HARFE mitte" show apartment will now function as an information center for anyone interested in our "GLEISHARFE süd" new-build project, where more modern one- to four-room condominiums with high-quality equipment and furnishings are currently under construction. Both "GLEISHARFE süd" buildings are located on the southern end of the neighborhood and are surrounded by extensive green spaces.